What if your area isn’t mapped? Or you want to add a feature, like a waterway or lake? 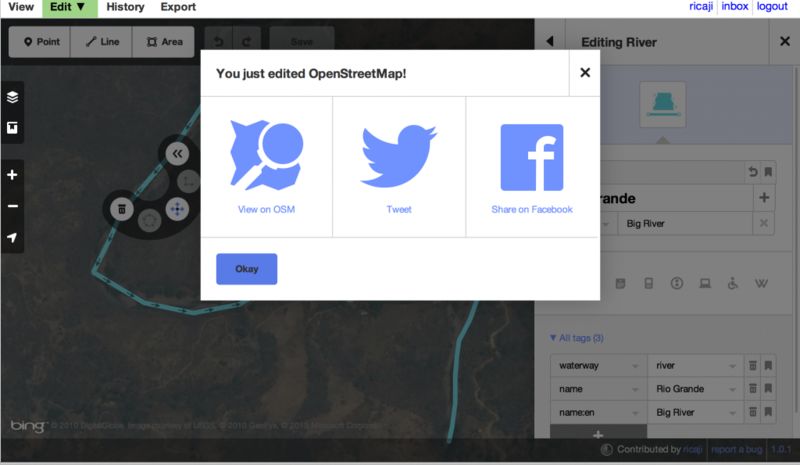 You can easily edit the OpenStreetMap base map that you find at www.openstreetmap.org. And while doing it you will become part of the community of thousands of mappers worldwide who are creating the map together. 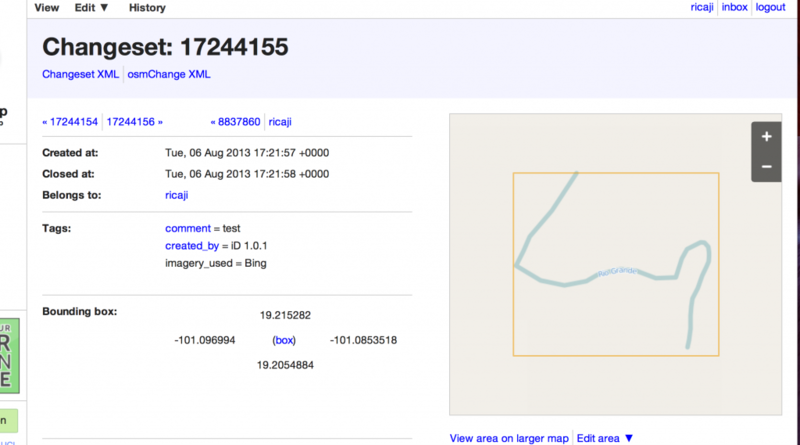 You’ll also support open, free use of map data by using OSM instead of a commercial product (like Google). 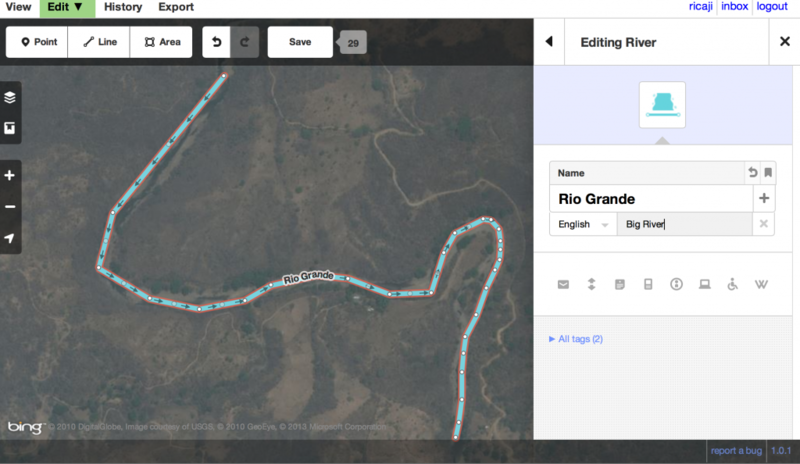 This will become important when you need to actually do something with your map that’s not permitted by Google (see Downloading map information from OpenStreetMap). 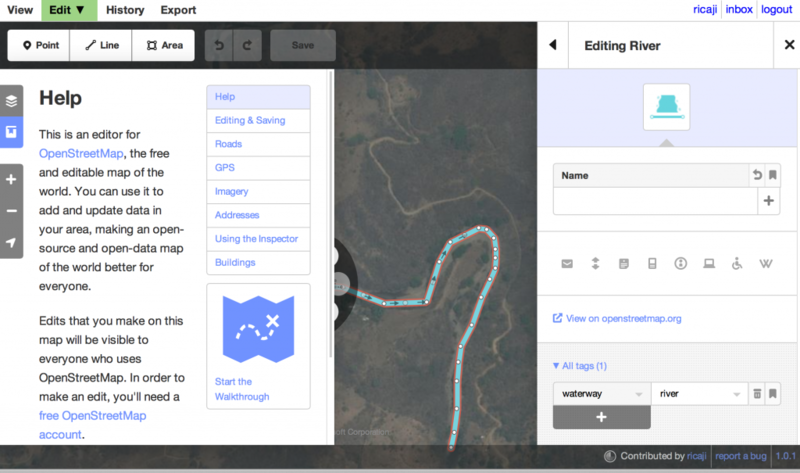 It’s also important because you can edit OSM immediately – no need to wait for edits to go through a corporate review process. You can then start using your map right away. Of course, if you create something incorrect, the thousands of users worldwide will monitor and remove it. This is called a Wiki – and works something like Wikipedia to keep the maps accurate. Go to www.openstreetmap.org. First, click Login in the righthand upper corner and either register yourself or log in if you’re registered already. You have to have an account in order to edit the map. Then, center the map image on the place you wish to edit. You can use the Search box on the left hand side to find your area, or use the zoom button to zoom out then slide the map to your desired location, and zoom back in. Then click the small arrow to the right of the word Edit above the map. There will be a drop down menu. Select “edit with iD”. You can always do the Walkthrough in order to see how to use this editing software. Or, click “Edit Now” and follow this tutorial! 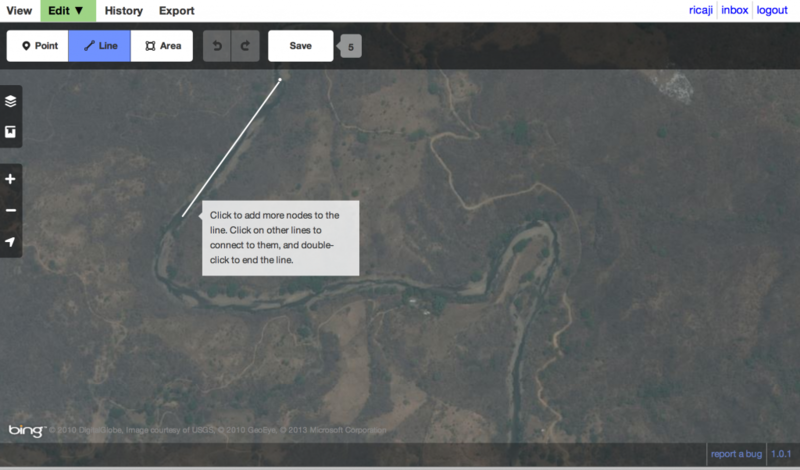 You may be told to “Zoom in to Edit the Map” if you’re not sufficiently zoomed in – just click there. 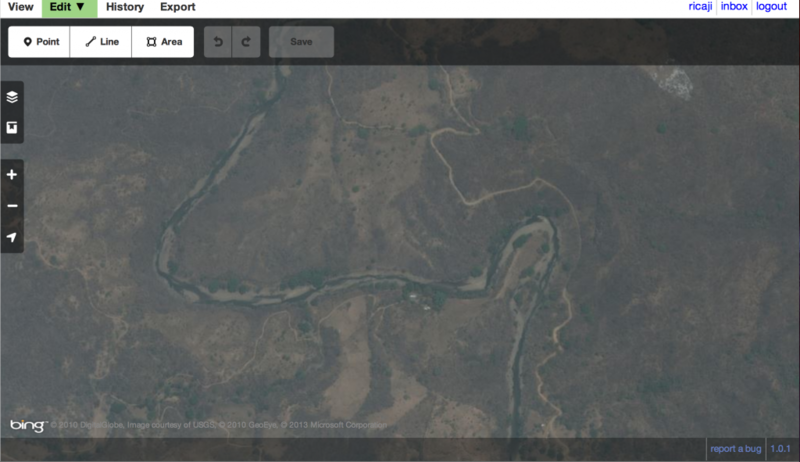 Once the software displays all the mapped features on top of a nice satellite image provided by Bing, you can see a hand replace the arrow of the mouse pointer. Then you can grab and slide the map around to make sure it’s in the right place. Next, we will be adding a water feature – a river – to the map. Click on where it says “Line”. Then click at the beginning of the river in your screen. You can then click again along the path of the river, creating an approximation of the river. Pop up windows with text will help you along the way. 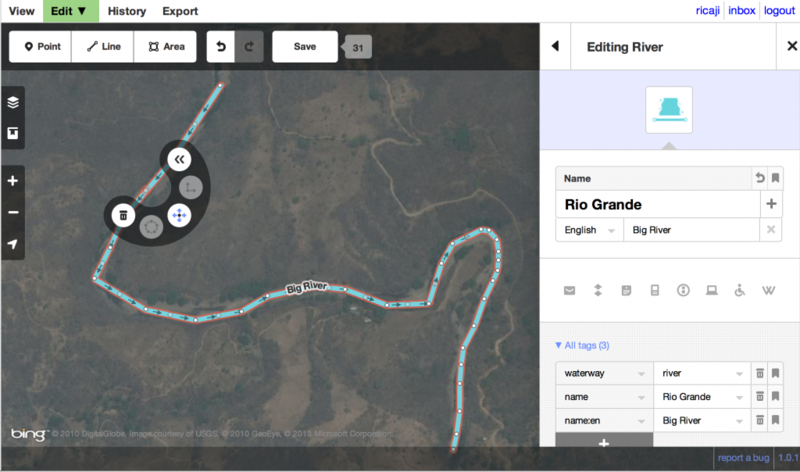 At the end of the line, double click and your river map is complete. After you double-click, this side bar will pop up asking you what type of feature you’re mapping. Select in this case, Water, then River. Then you’ll be asked to add a name for the river. You can add it in the original, local language. You’ll see a down arrow to the right of the name box; click there and another box will open. There on the lefthand side you can select a secondary language like English and write the name in that one too. This is a good idea when you want to make sure all the languages of map users will be represented. If you click where it says “All tags”, you’ll see how the name and feature are being recorded in the OpenStreetMap database. This is useful to know in case later on you end up using a different editor. This is the standard tagging structure for OSM. If you click on the upper right hand button shaped like a square above the name, you’ll see how the tag was determined and get a link to the OSM wiki. This is because many times (though not for a river which is fairly simple) people will discuss how to categorize things and try to come to collective decisions on the tagging. If you end up mapping something unusual and can’t find a tag category for it, try looking there. Now go ahead and click Save. You’ll see a list of your changes to the map. You should add a quick message about what you’re adding, in case someone wants to follow up and verify it or contact you later about it. Once you hit the final save button, your addition is live on OSM! What if I made a mistake on the line? There are several ways to make changes to your line. In the example, there is a spot where I want to add more points so the line is better following the curve of the river path. As you can see below if you click once on the line where there is no point, a grey dot appears. If you click again there and hold, you can add a point there and move it around. The semicircle that pops up around the grey dot also gives you some options, like discard that part of the line or in the case of a river, change the direction of the river flow. You’ll see some arrows on your river, which are meant to indicate which direction it flows. Make sure you have that correct, too. 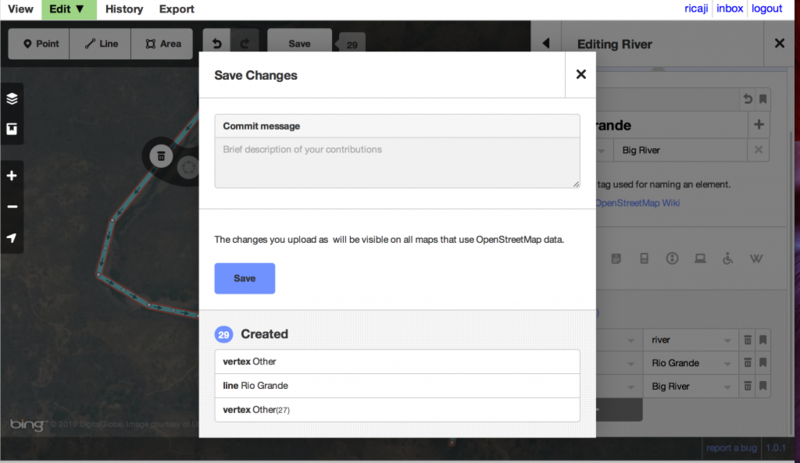 Don’t worry if you’ve already saved, everything in OSM can be edited at any time! After you’ve saved, you should let everyone know by sharing on Facebook or Twitter! Or just go see your edit in the live map. What if you made a mistake? I’ve actually named this river myself so the name is incorrect. Well, someone might come along and delete my edit. Eventually that will in fact happen. But I can also remove the name myself. I just go back to the window where I was editing the map (it should still be open) and click the river again to open the editing window. I click where it says All tags to open the tag list. Next to the names, I click the small trash can and the names disappear. Don’t forget to Save! Mikel Maron (@mikel) is a programmer and geographer working for impactful community and humanitarian uses of open source and open data. He is co-founder of Ground Truth Initiative, and of the Map Kibera project. He’s also Founder and President of the Humanitarian OpenStreetMap Team, having helped to facilitate the OSM response to the Haiti earthquake. He’s travelled widely, organizing projects in India, Palestine, Egypt, Swaziland, and elsewhere. Previously to this, he co-founded Mapufacture and worked on collaborative platforms, geoweb standards, and various applications, with a wide spectrum of organizations from UN and government agencies to anarchist hacker collectives. Computer with a fairly consistent internet connection. If you do not have a good internet connection, you can still make a map. You will want to download a desktop software such as Java OpenStreetMap editor. You can edit there, then when you get reconnected you can upload the data. 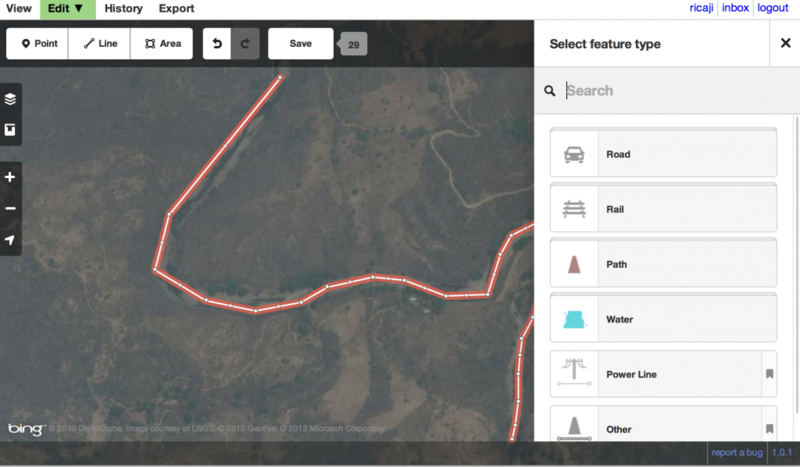 It’s a good idea to check out the OpenStreetMap tutorial at https://learnosm.org/en/ at some point, to learn more or in case you get stuck with something we haven’t covered here.